I really had fun with this illustration. It is based on a black and white lined commissioned work. But here I could just play and do with it what I wanted. I’ve learnt a few new things in illustrator like using the blob tool, the pathfinder and adding texture through photoshop. It is so good to try these things; it motivates me to want learn more. I have completed this e-book cover. The final version is a little different. Follow the link to read about the author and where the book can be purchased. My holiday project was to make cards with my alphabet pictures and to include Victorian Cursive. I can now use these with my prep students. I have just finished an e-book cover. Will post it soon. 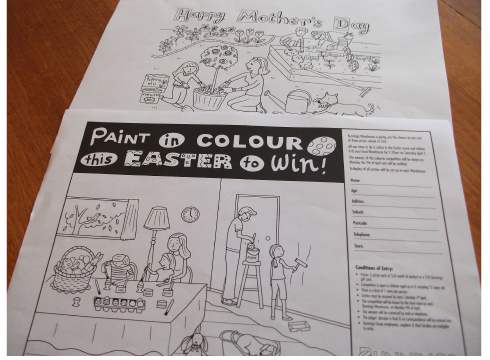 Some more colouring competitions for Bunnings. One of my designs is now on Indigoprints. This is a personal piece I’ve been working on. I have aspirations to make a nursery rhyme app. Here is a rough drawing for Bunning’s Christmas Colouring competition. A new illustration for an Art show next month.